Perhaps no part of Silver Spring has seen as many changes in the past five years as South Silver Spring, the neighborhood between the Red Line tracks and Eastern Avenue. It is our Williamsburg, a mess of parking lots, auto shops and warehouses that has rapidly given way to high-end condo towers and well, more high-end condo towers, but the annual Block Party gets better every year. The photo above comes from this 2002 presentation (warning! PDF file.) on the Pedestrian Linkages in South Silver Spring, the last phase of which will be dedicated tomorrow. 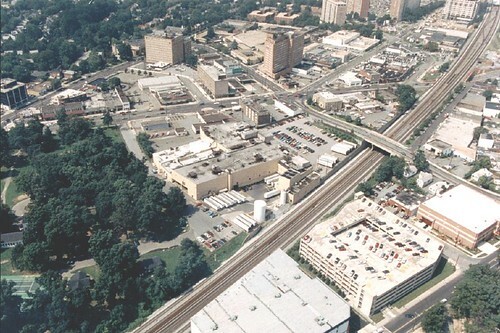 In it, the Red Line is running across diagonally, Downtown Silver Spring is to the right of the shot, and in the middle is the intersection of Georgia, East-West, Burlington and 13th Street. hese photos were taken by Evan Glass, resident and president of the South Silver Spring Neighborhood Association (whose blogroll looks conspicuously empty, if you catch my drift) on a plane ride over MoCo last October. You can see that most of East-West Highway has filled in with apartment buildings like the Bennington (2006), the Veridian (2009) and 1200 East West, which will open next year. Towards the bottom, there's the new Montgomery College Health Services Building (2004), the School of Art and Design (2007), and the Performing Arts Center (2009). There's still room to grow, however. South Silver Spring is hurting for retail and could use a greater presence on Georgia Avenue, where local institution Mayorga Coffee Roasters will bite the dust in just two weeks. But it's exciting to see the combined result of little changes that we might not notice on a day-to-day basis. These images clearly illustrate how desperately we need more pedestrian (and dare i say vehicular!) connections across the train tracks between E-W Highway and the so-called Ripley Distict. There are 1000's of residents who do not patronize DTSS because they can't easily walk there. Totaly with Roger. They need to create a bridge/road continuing Silver Spring Ave. over to Eastern.